Obtained in episode: Setting the World on its Buneary! Obtained in episode: Twice Smitten, Once Shy! After allowing a princess called Salvia to take her place in a Pokémon Contest, Salvia was kind enough to allow Dawn to have her Togekiss so that Togekiss can partake in Pokémon Contests, which Salvia herself is unable to do. Togekiss has many powerful attacks such as Aura Sphere that allow it to be able to be able to hold its own in battles as well as create dazzling appeals. While Dawn was helping Professor Rowan to get some runaway Pokémon back, Dawn & her Pokémon got captured by a swarm of Ariados. In order to help, Cyndaquil evolved into Quilava and managed to use its massively powerful attacks such as Eruption to defeat the Ariados and protect its trainer. Left with O in episode: To Thine Own Pokemon Be True! Captured in episode: Hungry For the Good Life! Obtained in episode: Buizel Your Way Outta This! 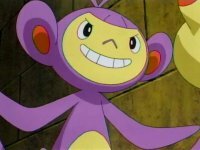 Traded to Ash in episode: Aipom & Buizel! Respective Roads!